What can be said about the free game by the name of Daedalus? It's different. I've not encountered anything like it before. Daedalus is a massively-multiplayer maze game in which you're assigned one of two tasks: a) paint a new maze in less than two minutes or b) solve a maze someone else designed in under a minute. First, painting a maze is done with basic paint tools. Draw, clear, zoom, and pan. That's about it. And while you're doing this the timer is nagging away in the upper right corner of the screen. Designing a maze is easy. Designing a good maze is hard. And that's the point... trying to design mazes that others can't solve in a minute. Next, there's solving a maze. You are forced to do this while zoomed all the way in so you can not see the entire maze at once. Top that off with not knowing where the exit point is and a simple maze starts to offer some challenge. Usually it's about navigating around quickly until finding an exit. As you navigate you can easily backtrack should you realize a mistake has been made with what is effectively a rewind button. So far of my 5 mazes only 1 has been solved... and I haven't failed to solve a maze aside from exiting. That may be my biggest issue with the game. Exit after being tasked to solve a maze and it's considered a forfeit. You can only exit cleanly when designing a maze before submitting it. This isn't a graphic power house and is done only in black and white aside from the green starting dot and red exit dot. It's all about the mazes, baby. Everything is controlled by the touch screen and consequently laying down a precise design is nearly impossible given the time limit. 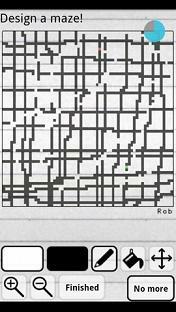 Forget about the traditional mazes that consist of only horizontal and vertical lines. The mazes in Daedalus look more like I'd expect an overview map from Mammoth Cave to look. Initially the game felt empty to me until a found the profile stats where it shows me how many I've solved and how many of my mazes have been solved. It would be nice to know if my mazes had been attempted and likewise are mazes attempted by others until they are solved? Better stats (or scoring) would be welcome. As is Daedalus can be oddly addictive and earns 4/5 stars mostly because it's free and clever.